ZINC: The diet in many developing countries is lacking zinc, but researchers have just solved the riddle of how to get more zinc into crop seeds. 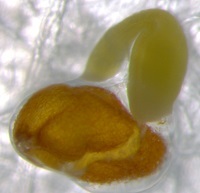 The discovery has been published in Nature Plants, and the research was led by University of Copenhagen. The first step on a longer journey The researcher’s onward plan is to dig deeper into the function of the zinc pumps in thale cress with the final goal being to transfer the principles to conventional crops. However, if this is to be done, especially one problem captures the attention of the researchers. “The zinc pumps not only transport zinc but also cadmium into the seed and unfortunately cadmium is a toxic heavy metal. Therefor we are trying to find a way to separate the two functions, thus enabling us to enhance the transport of zinc without enhancing the transport of cadmium accordingly,” Lene Irene Olsen says. “Theoretically it could be possible to breed plants that are effective in clearing contaminated soil of cadmium,” he points out. This story can be read at the Department of Plant and Environmental Sciences website, as well as in the daily newspaper Politiken, which have brought a Danish story.